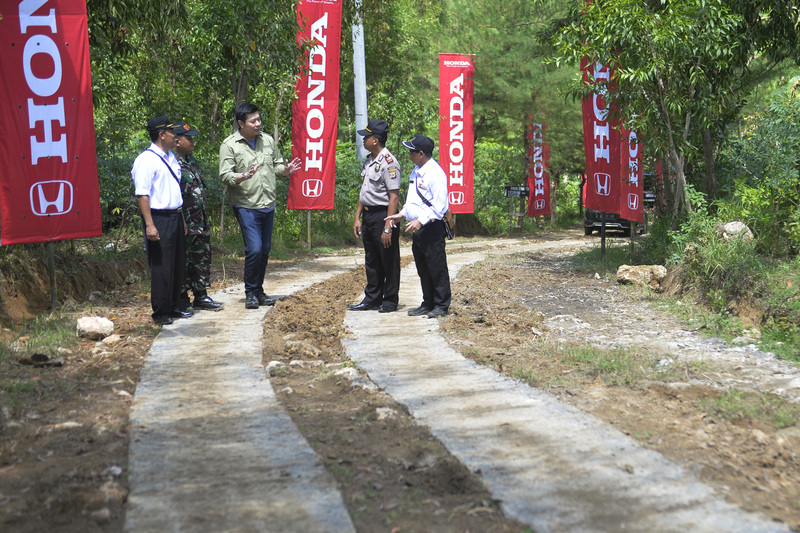 Marketing & After Sales Service Director of PT Honda Prospect Motor (HPM) Mr Jonfis Fandy (centre) talked with village officials when he inspected the concrete road that PT HPM donated and built in collaboration with a community group for tourism awareness at Jungwok Beach, Gunung Kidul (Daerah Istimewa Yogyakarta), 12 April 2017. 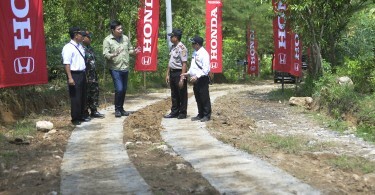 The 555-meter long concrete road to will facilitate access to the tourist spot, and is expected to improve the economy of the surrounding community. 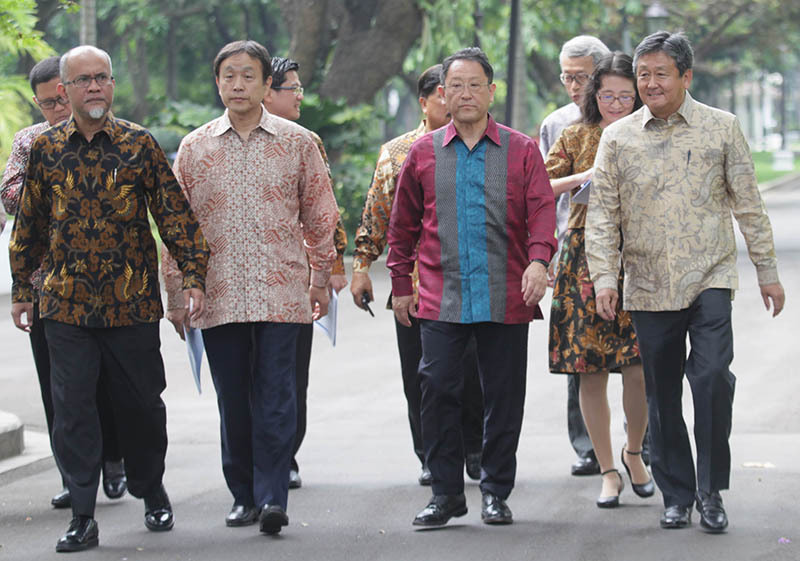 Toyota Motor Corporation (TMC) President Mr Akio Toyoda accompanied by President Director of Toyota Motor Manufacturing Indonesia (TMMIN) Mr Warih Andang Tjahjono is about to meet with President Joko Widodo at Merdeka Palace, Jakarta on 13 April 2017. 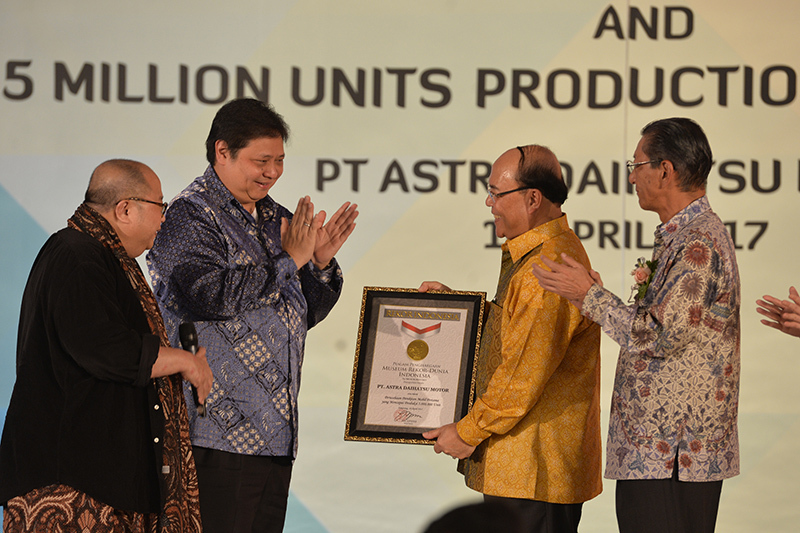 Mr Akio Toyoda conveyed Toyota’s commitment to continue to participate in the development of Indonesian automotive industry through investment, export, employment, and human resource development. He also introduced Mr Warih Andang Tjahjono who now is in charge at the top leadership of PT Toyota Motor Manufacturing Indonesia to replace his predecessor Mr Masahiro Nonami. 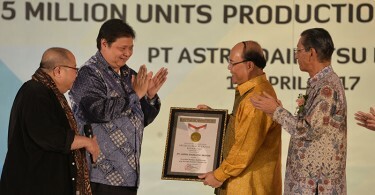 Minister of Industry Mr Airlangga Hartarto (second left) with Director of Museum Rekor Indonesia (MURI) Mr Jaya Suprana (left) and ADM Senior Executive Director Mr Tsuneo Itagaki (right) handed MURI award to President Director of Astra Daihatsu Motor (ADM) Mr Sudirman MR (second right) for the achievement of production of five million units of vehicles in Suryacipta Industrial Estate, East Karawang (West Java) on 10 April 2017. ADM also inaugurated the center for research and development, emphasising its commitment to advancing the automotive industry in Indonesia. 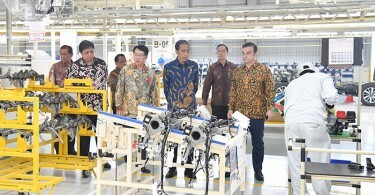 President Joko Widodo, Minister of Industry Mr Airlangga Hartanto (second left), Head of Investment Coordinating Board (BKPM) Mr Thomas Lembong (second right), Vice Governor of West Java Mr Deddy Mizwar (left) and Chairman of Mitsubishi Motors Corporation and Renault-Nissan Alliance Mr Carlos Ghosn Right) at the new plant of Mitsubishi Motor Krama Yudha Indonesia (MMKI) being officially inaugurated at Cikarang, Bekasi (West Java), on 25 April 2017. 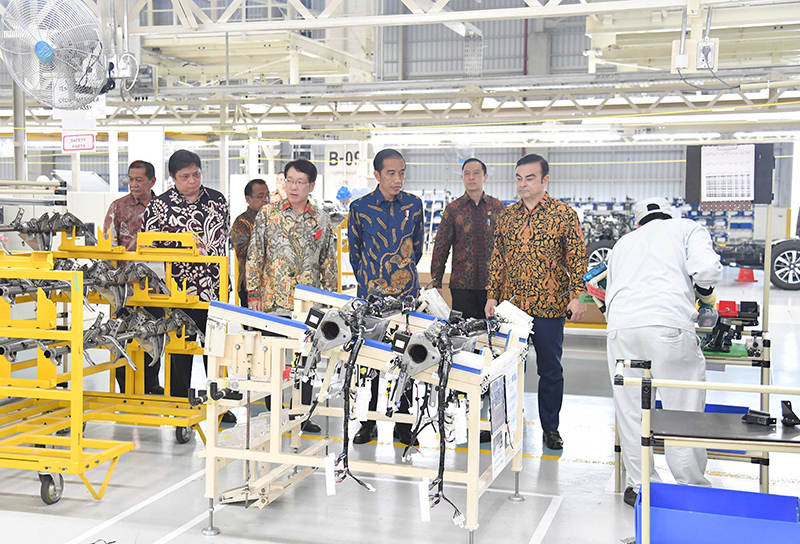 The plant has a production capacity of 160 thousand units per year to manufacture Pajero Sport, small MPV, and Colt 300.